I like what these women are aiming for, but I have to say that I don’t think making the box white and more minimalist will actually do much to make women buying pads and tampons feel “confident of their purchase and not embarrassed”. Mostly because the embarrassment comes from buying something that goes you-know-where. Generally, anything related to private bodily functions will always make some people embarrassed. And once people became familiar with this packaging it would be just as recognizable as something that is a recognizable tampon package now, and people will just be embarrassed buying this new kind. Maybe a two-pronged attack with subtle packaging+reducing the ‘eww, ladybleeding’ attitudes that some people seem to have? Also, to anyone out there who does hate buying this stuff: if part of it is the bit where the checkout operator is scanning your box of tampons, then fear not; as a former checkout person I can reassure you that I (at least) never paid any extra attention to people buying pads or tampons. Also, self-service checkouts were clearly made for this kind of situation where you don’t want anyone to see what you’re buying. 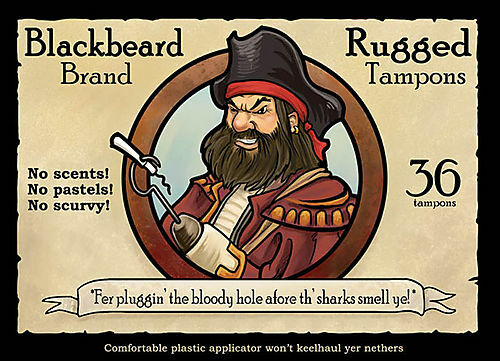 And also, how about some Blackbeard tampons? This entry was posted on Tuesday, August 31st, 2010 at 9:10 am	and is filed under periods. You can follow any responses to this entry through the RSS 2.0 feed. Both comments and pings are currently closed.